I am here to confess your sins. It's never too late to repent your monstrous ways. . . even after an eternity." 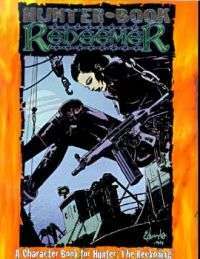 Redeemers: the self-appointed saviors among hunters. Redeemers believe that any soul, even a monster, can atone for its sins. The price of penance is high, though - as high by the reckoning of these imbued as the depth to which the enemy has fallen. What makes these hunters seek value in the undeserving? Desperation? Despair? Destiny? Are you even worthy of the answer? Hunter Book: Redeemer is part of a Hunter: The Reckoning series dedicated to the creeds, the character types of the imbued. Learn Redeemers' philosophies, motives and ultimate goals in delivering monsters from evil. All these new Traits, edges and rules help ensure that amends are made, even if it's by Last Rites. None is so far fallen. . .